5,262 miles. $1,134 in gas. 76 hours on the road. 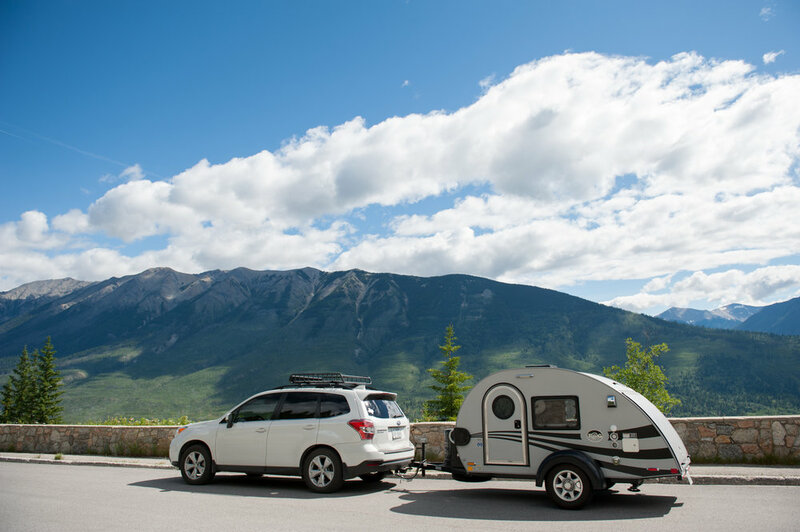 For the second summer in a row, we embarked on a 16-day national park road trip that led us through Wyoming, Montana, and Canada. We knew this would be the trip of a lifetime, but honestly, it surpassed even our wildest expectations. We began the trip in Pueblo, CO at a whopping 103 degrees. Although it was intended to be an easy stop (setup, dinner out, early to bed), our car was rear ended by a drunk driver while parked at a restaurant, so that was pretty inconvenient. The great news was that the back door still opened, the hitch was fine, and the other driver's insurance will be paying for the damages. Thank goodness! That could have been the beginning and the end of our trip. By the time we made it to our first national park we'd already been driving for days (literally) and it felt like we'd never make it! The thermal pools, geysers, and geothermal features at Yellowstone are absolutely breathtaking. We were so glad to arrive before all of the tourists on our first full day. We hiked the Biscuit Basin trail and experienced nature in a completely new way. Old Faithful was neat, but there are so many other amazing features to see, so we're glad we kept hiking around the park! Our sunset hike at Schwabacker Landing had to have been the highlight of this park for me. For Bry, it had to be fishing in the Snake River and bringing home lake trout to grill like. a. boss. We had super high expectations for this park, but it definitely took some time to grow on us. When we first arrived, most of the park was still closed off due to snow on the roads. BUT, by our last day, the roads were cleared and the famous Road to the Sun was open for bizzz. The other highlight of this park for us was the sunset boat tour we went on with Bry's parents. It was slow going at first, but we ended up loving this park after we were able to fully experience it on our last day. We've decided we need a Glacier do-over closer to the end of July in another year or two. BANFF!!! Where do I even start with you???? I fell in love with Canada the way you fall in love with a boy in middle school. Seriously. It takes you by surprise. You're confused and completely consumed by these fluttery feelings in your stomach. I know that sounds super weird, but I don't care. It truly was like falling in love. I had no clue that we'd be surrounded by these gorgeous mountain ranges and turquoise lakes at every turn. I completely let myself fall madly, deeply in love with this park and decided I was ALL IN. A few months before we left, I reached out to at least ten Canadian photographers and the one who stood out the most to me by far was Elizabeth Fodor. You can find her gorgeous work here: http://www.elizabethmarie.ca/ We immediately clicked and I could tell she was the exact photographer I had been looking for. We planned a dreamy sunrise shoot in Banff and we're greatly anticipating seeing what she captured. The photos we've seen so far look exactly like what I had dreamed. She is amazing!!! We plan to post some of the photos she took on our Instagram pages, so be sure to follow along if you want to see them! Many people have asked for the exact itinerary in an effort to help them plan their own trip. If it's helpful, here's a rough outline of the mileage and stops. Note: These estimates do not take into account stops along the way, driving through customs, or driving aimlessly around the massive, gorgeous parks. It's also important to note that we made our campsite reservations 5-6 months in advance of the trip. They fill up fast, so you definitely don't want to wait too long if you want a spot! When considering planning your own trip, we would recommend planning at least two full days in each park. Last summer, we only planned one full day which included a 4-7 hour hike, so we didn't have a lot of time for much else. We also came to the realization that we don't feel like we've really been to the national parks until we take a high altitude, long drive around the park. It is through these leisurely drives that we can fully experience the beauty and wonder each park has to offer. While you're in the little mountain towns, consider supporting local outdoor shops and chat with the local employees. We love asking people their ideas about must-do's in the parks.